Important: if you are an international student requiring a Tier 4 student visa to study in the UK, you will need an ATAS certificate if you wish to apply for the Aerospace Engineering, Astronautics & Space Technology MEng course. Read further information. Once you have completed the Aerospace Engineering Foundation Year (UCAS code H408), you can transfer on to the Aerospace Engineering, Astronautics & Space Technology BEng(Hons), dependent on satisfactory grades. These courses are ideal if you are interested in the design, construction and operation of aircraft but would like to extend your study of aerospace engineering beyond the atmosphere and up into space. Both degrees are accredited by the Royal Aeronautical Society as leading to chartered engineer (CEng) status. The course scored 93% for academic support in the 2016 National Student Survey. Year 1 is common across all our chartered engineer status degrees. It provides skills and knowledge required for further study. Subjects include mathematics, electronics and thermodynamics and engineering applications, alongside an introduction to the engineering profession. You will examine the engineering challenges of robotic and human spaceflight (including practical rocketry), and get hands-on experience with real space hardware. the functional analysis of spacecraft and their payloads and space dynamics, and will carry out a practical design exercise involving rockets. There will also be an industrial visit and guest speakers from industry. Year 3 includes a module on space vehicle design. This is divided into critical support functions for space missions, core spacecraft subsystems, mechanical systems and an introduction to space mission design. Core lectures will be enhanced by industry visitors and tours to space companies. You will also carry out an individual research project. BEng students will take part in a group design project similar to the MEng students and get hands-on experience with real space hardware. In Year 4 of the MEng degree, you will continue to deepen and broaden your expertise and undertake a major group design project. A specialist Space Mission Analysis and Design module will cover the design, cost, logistical and operational implications of space missions. The Aerospace Engineering, Astronautics & Space Technology MEng course is accredited by the Royal Aeronautical Society and satisfies, in full, the academic requirements for Chartered Engineer (CEng) and Incorporated Engineer (IEng) registration. The Aerospace Engineering, Astronautics & Space Technology BEng(Hons) course is accredited by the Royal Aeronautical Society and satisfies, in part, the academic requirements for Chartered Engineer (CEng) registration and in full, Incorporated Engineer (IEng) registration. Find out more about the full criteria and validity for Chartered Engineer (CEng) status and Incorporated Engineer (IEng) status. This degree has been accredited by the Royal Aeronautical Society under licence from the UK regulator, the Engineering Council. Accreditation is a mark of assurance that the degree meets the standards set by the Engineering Council in the UK Standard for Professional Engineering Competence (UK-SPEC). An accredited degree will provide you with some or all of the underpinning knowledge, understanding and skills for eventual registration as an Incorporated (IEng) or Chartered Engineer (CEng). Some employers recruit preferentially from accredited degrees, and an accredited degree is likely to be recognised by other countries that are signatories to international accords. Please check the Engineering Council website for more information. 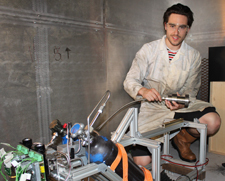 For his final-year project, Jack James Marlow created a modular rocket test system that's the only bi-propellant system available for students in the UK. Find out more about the projects our students have done on this course. The module introduces the student to basic aerodynamics, aircraft systems and propulsion using the Kingston Learjet aircraft to provide a frame of reference. Students on the Aerospace, Astronautics and Space Technology routes (Astro students) will be introduced to the essential differences between space engineering and its environment, and aircraft and aerospace engineering. The module starts by introducing the International Standard Atmosphere and basic aerodynamic terms, followed by basic discussion of the theory of flight, stability and lift augmentation. The ATA systems covering general construction, layout and operation of aircraft systems and components will be covered. The module then introduces typical Gas Turbine and associated system architecture before concluding with broad coverage of the Aerospace Industry, its Regulation, Licensing and Accreditation, while Astro students will be introduced to the space environment and history of spaceflight, illustrated with examples from UK, European and international space missions in place of certain aircraft specific (eg. ground handling) teaching. This module introduces the students to the fundamentals of thermofluids (thermodynamics and fluid mechanics) and solid mechanics (statics and dynamics). The thermofluids section of the module covers the key concepts of system, work, heat and the main thermodynamics laws (zeroth, first and second laws) with special reference to their engineering applications. This section also introduces the main equations of fluid mechanics and dynamics, dimensional analysis, properties of fluids and their measurement methodology and units. The solid mechanics section provides an understanding of the behaviour of particles and rigid bodies whilst stationary and in motion. Bodies under equilibrium are studied and the external and internal parameters such as force, moment, stress, strain etc. are defined, derived and used for problems solving. This section also introduces kinematics and kinetics/dynamics of particles and rigid bodies with their engineering applications. The module is primarily delivered through lectures supported by tutorials sessions and laboratories. Course materials will be available on Canvas. Describe the fundamental properties of a fluid, use correct unit, property tables and charts. State and apply the zeroth, first and second laws of thermodynamics to engineering problems. State the basic equations of fluid mechanics, explain the concepts of pressure, temperature and measurements methods. Describe laminar and turbulent flows and apply continuity, momentum and energy equations to fluid flow. Determine the external and internal forces and moments in simple structures under equilibrium and carry out one-dimensional stress analysis of engineering components in tension, compression and bending modes. Carry out kinematics and kinetics analysis of dynamic systems with constant and variable accelerations. Apply Newton's laws and energy method to engineering components in motion modelled as particles and rigid bodies. This module introduces the basic concepts from electrical and electronic engineering, using analytical methods. The module embeds a solid foundation in engineering mathematics which is then conceptualised to find solutions to engineering problems. An introduction to basic programming skills applied to engineering problems is also included. Apply simple principles, laws and theorems to the analysis of electrical and electronic circuits. Describe characteristics of electrical systems, electronic devices and electronic instruments including key concepts such as amplification. Apply basic programming skills to simple engineering problems and demonstrate appreciation of importance of programming in engineering. Perform calculations using matrix algebra, trigonometry and complex numbers. Use calculus to solve engineering problems. Use statistical methods, including probability to an engineering problem. This module aims to develop competence in the application of the fundamentals of engineering design to a given specification including the manufacture and testing of that design. The module provides an understanding of the structure and synthesis of a broad range of engineering materials, their test methods, structure, implications for manufacture and the control of these structures to produce optimum performance in service. The design part of the module will develop skills in engineering drawings and computer aided design (CAD) and solid modelling together with an introduction to the fundamentals of material science. Produce and interpret engineering drawings in accordance with international standards. Demonstrate proficiency in the use of solid modelling technologies in the design and development of products. Describe and apply the engineering design process from specification through to design optimisation. Apply a knowledge of molecular structure, crystalline structure and phase transformation to identify different types of materials and to describe their range of properties and applications. Describe the characteristics of a range of common engineering materials including the various failure modes and provide simple analysis using appropriate analytical tools such as the concept of fracture mechanics. Identify and describe common engineering manufacturing processes. The purpose of this module is to develop your understanding of the fundamentals of aerospace engineering design. It will provide you with the skills necessary to undertake the group design project. It is common to both the Aerospace and Astronautics programmes, but some of the detailed design elements will be taught separately and the astronautics students will do a space vehicle related design project. It also brings together various elements of generic project engineering and management. Project planning and scheduling is covered in detail, including the use of project management software. Financial aspects are looked at in respect of discounted cash flow and budgeting, and quality management is introduced. The module is delivered through lectures, tutorials and design activities, with additional support material available on Blackboard. This module builds deals with advanced electronic systems and concepts from classical control, including feedback control systems and analysis of their response and the effects of the feedback loop. The content of this module is informed by the research performed by the teaching team. In order to improve your employability, a range of engineering programming tools are used to model and analyse the performance of engineering systems, enabling learning of the functionality of control analysis and design software. This module reinforces your prior knowledge of statics, materials and dynamics and introduces topics of particular relevance to aerospace studies. The module includes further work on the analysis of beams, materials used in aerospace such as composites and develops the students understanding of vibration theory as well as application of dynamics of particles and rigid bodies in aerospace. Topics such as Bredt-Batho theory and aircraft dynamic performance and stability and Finite Element application in static and dynamic analysis of structures are also introduced. The module is primarily delivered through interactive lectures and practical laboratory sessions and is supported by tutorials, where students have to practise using problem sets. Course materials are available via VLE where appropriate. The module as a whole draws upon the learning experiences of Modules ME4011 and ME4012 and provides further learning more specifically required for the potential aerospace engineer. The basics of aerodynamics and aerospace propulsion are introduced with a view to provide the ability to analyse, formulate and solve elementary problems. This is underpinned by covering the mathematics required for the BEng/MEng Aerospace Engineering course. The mathematics side of the module is taught in the context of the solution of engineering problems. This module builds on the introduction to space engineering given in levels 4 and 5 to give a detailed understanding of space vehicle design, broken into core (eg. power) and mission enhancing (e.g. propulsion) subsystems. This is not intended to enable you to carry out detailed design of effective space missions, which requires a graduate level course, but will provide (a) a thorough understanding of the challenges of space engineering, (b) a toolset, reference material and confidence to tackle future design problems you may face, and (c) an understanding of the drivers for space engineering (politics, economics and technology in that order). Context will be provided through reference to a number of past UK, European and International space missions. Electrical spacecraft subsystems (power, environment, TTC, payload and data handling). Mechanical subsystems in particular spacecraft structures, propulsion, thermal, and attitude control and their differences from aero or aerospace vehicles are covered. The student knowledge and skill base on rocket launcher design and critical support functions for space mission including operations, and systems engineering are addressed. Basic concept and solution procedures for problems such as spacecraft subsystem and orbit selection and sizing, supported by commercial packages such as satellite toolkit will be carried out. The module is designed to be delivered as blended learning, to support L6 students on site as well as those who are on placements. The module is primarily delivered through recorded lectures, computing and software exercises and some practical classes (not available to students on placement). A booklet of worked example problems designed to support the exam assessment will be made available, and for those students on site will be worked through in fortnightly tutorial sessions with a graduate teaching assistant. Periodic guest lectures and workshops using industry experts will take place, material from these if not commercially sensitive will be made available for download. Industrial visits to spacecraft subsystem manufacturers will be offered. Additional support materials including excerpts from core texts will be available through Canvas. This module gives you an opportunity to work as a member of a design team on an aerospace design project. It also further develops your broader understanding of the business context of engineering activities. It will develop a set of skills and techniques which will prepare you for employment. Analyse and evaluate relevant subject areas previously covered in the course. Acquire and appraise new knowledge related to the project. Show willingness to apply individual judgement to new problems. Apply creativity and show intellectual input. Show organisational capability (through arranging meetings with supervisors, setting project goals and meeting appropriate deadlines). Communicate with others (through completing reports and a log book, as well as presenting a seminar and producing a display poster for the project). Professionally this module allows you to show high levels of responsibility and organisational capability (through arranging meetings with supervisors, setting project goals and meeting appropriate deadlines) as well as demonstrating effective communication with others (through completing reports and a log book, as well as presenting a seminar and producing a display poster for the project). Furthermore the module encourages you to recognise, question and deal with the ethical dilemmas that are likely to occur in engineering professional practice and research. Furthermore this module provides you with an opportunity to further enhance the independence and employability skills industry is looking for in its graduate engineers, especially those seeking professional recognition as Incorporated or Chartered Engineers. This module extends the analysis of aerodynamic and propulsive systems with a view to provide the ability to design and evaluate aerodynamic loadings on aerospace vehicles as well as their propulsion systems. It also extends your knowledge and skill base on solving aerospace engineering problems with advanced analytical approaches, namely computational fluid dynamics with a view to equip you with up-to-date flow and structure analysis techniques. Subsonic, supersonic, compressible, incompressible, boundary layer, inviscid and viscous flows are all considered in high-speed and low-speed aerodynamics. On the propulsion side, the topics considered are air breathing cycles, axial flow turbo-machines, and combustion systems. The computational fluid dynamics part includes basic concept and solution procedure for problems such as flow over airfoil and wing by using commercial package suit ANSYS as a major tool. This is a level 6 module that extends and deepens your ability to apply the analytical techniques used to design aerospace structures. These analytical techniques are used to enhance your understanding of the functions of typical aerospace structural components. You will study the multifaceted discipline of materials technology applicable to typical aerospace structures based on fracture and fatigue analysis and the finite element method. It also provides you with an understanding of aircraft dynamic stability, performance, and structural dynamics characteristics. This is achieved not only through analysis but also through a live flight test. The wide ranging set of topics considered in the module gives you ample opportunity to see how the various disciplines interact in the aerospace design process. The module is designed to provide you with the research skills and techniques necessary to select and justify a research topic, plan project execution, use various resources to carry out a literature search and successfully complete the project and other module assignments on the course. It further develops your knowledge and skills in business and management, with a particular focus on entrepreneurship and innovation. It supports you in producing proposals for enterprise ideas such as new products or services, or innovations in existing processes or organisations. Concepts of total quality management to enhance quality of products and processes in an industrial setting are presented and application of supporting quality tools and techniques are discussed. Further equips graduates with a good understanding of the challenges of space engineering, a set of tools and references to tackle future design problems, and a set of contacts with industry to help begin their careers. Building on the space vehicle design course at level 6, the module is intended to provide experience at space mission (compared to space vehicle) analysis and design through a range of largely self-taught activities, and is assessed through seminars, design build and test, and short written assignments. This module will provide (a) in addition to the knowledge from Space Vehicle Design AE6030, a thorough understanding of the challenges of space engineering, (b) a toolset, reference material and confidence to tackle future design problems they may face, and (c) experience in the preliminary design, trade-offs and mission element selection for space mission. A space mission in addition to space vehicle(s), comprises instruments & platforms, launch vehicles, orbits and trajectories and ground segment plus user interfaces. The module will be primarily delivered primarily through self study, supplemented by guided tutorials, computing labs, on-line collaboration and industrial guest lectures. Additional support materials will be available on Canvas. The MEng Group Design Project is a module which runs throughout the final year of all of the MEng programmes in the School of Aerospace and Aircraft Engineering. It provides a capstone element to the course by providing an opportunity for students to work on a major engineering design problem in a team in a way which closely parallels a real-world project. The groups are assigned to a particular project which has an outline project description/specification/customer requirements provided by the teaching team. It is group's job to develop the specification in more detail, to convert it to a technical specification and then carry out the tasks necessary to complete the project. This module provides an opportunity for students to further develop academic skills delivered earlier in the programme. In order to successfully complete the module, the student must establish a plan and work schedule, perform the technical tasks necessary to fulfil the plan, monitor progress, manage the team activities, hold and minute formal team design meetings and resolve any problems that arise. The module is delivered primarily through weekly formal design meetings and regular informal meetings. This module is designed to develop the student's ability to apply a systems engineering approach to the analysis of aerospace systems. This will enable them to develop systems that are robust and able to respond to customer's needs. It will also ensure that they understand the full life cycle of aerospace systems and the associated costs. This module emphasises a variety of systems engineering techniques which are explored through case studies. These techniques can also be used in the group project module.